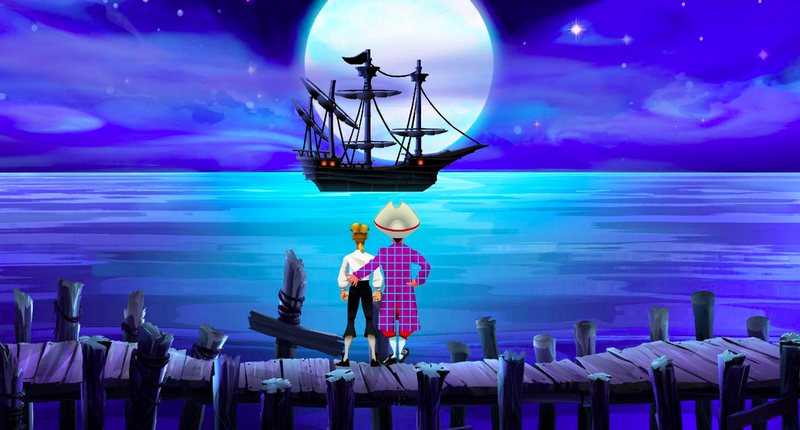 Monkey Island turned 25 years old earlier this week, and designer Ron Gilbert used his blog to share some truly interesting (and bizarre!) stories about the game’s development. In 2015, releasing a game to the world is pretty simple, especially digitally. It’s not quite click-one-button-and-it-appears-on-the-Internet, but it’s close. It was much different in 1990, though. Monkey Island was released on floppy disks, remember? During the final phase, in which the developers would try to figure out what bugs they were willing to ship with, Gilbert and others would spend hours copying game files over for testers. Also keep in mind that when I made a new build, I didn’t just copy it to the network and let the testers at it, it had to be copied to four or five sets of floppy disk so it could be installed on each tester’s machine. It was a time consuming and dangerous process. It was not uncommon for problems to creep up when I made the masters and have to start the whole process again. It could take several hours to make a new set of five testing disks. Sometimes, things would come down to the wire and to hit a release date, there wasn’t time to ship the floppy disk, so they’d have to beg random strangers to take them across the Atlantic. When the release candidate passed testing, it would be sent off to manufacturing. Sometimes this was a crazy process. The builds destined for Europe were going to be duplicated in Europe and we needed to get the gold master over there, and if anything slipped there wasn’t enough time to mail them. So, we’d drive down to the airport and find a flight headed to London, go to the gate and ask a passenger if they would mind carry the floppy disks for us and someone would meet them at the gate. Can you imagine doing that these days? You can’t even get to the gate, let alone find a person that would take a strange package on a flight for you. Different world. That’s really hard to fathom in the world we live in now, but there ya go. Elsewhere, Gilbert struggles to understand the impact Monkey Island’s had on people. It amazes me that people still play and love Monkey Island. I never would have believed it back then. I was very fortunate to have an incredible team. From Dave and Tim to Steve Purcell, Mark Ferrari, an amazing testing department and everyone else who touched the game’s creation. And also a company management structure that knew to leave creative people alone and let them build great things. I don’t know if I will ever get to make another Monkey Island. I always envisioned the game as a trilogy and I really hope I do, but I don’t know if it will ever happen. Monkey Island is now owned by Disney and they haven’t shown any desire to sell me the IP. I don’t know if I could make Monkey Island 3a without complete control over what I was making and the only way to do that is to own it. Disney: Call me. You should just read the whole thing! I’ve played (and thoroughly enjoyed) the first three Monkey Island games, but never got around to the fourth one that also showed up on PS2 and fell off the Telltale games pretty quickly. You?